Chairman Tony Stewart believes the mentality he shares with manager Steve Evans can help drive Rotherham United forward next season. 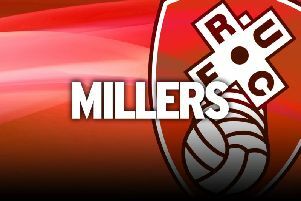 The Millers aim to build on their survival in the Championship by turning themselves into a top-half team. His club have proved their character with successive promotions and then a memorable campaign in the second tier when they stayed up despite a three-point Football League deduction. “Things in life, not just football, happen to test you, and it’s whether you can rise to the occasion,” Stewart maintained. He and Evans are targeting the top 10 and plan a summer of careful recruitment to help them achieve their aim. Evans has spent the last fortnight talking to players andsays the first new arrival could possibly be announced this week. Stewart added: “I think it will be a hard season. I think it will be a testing season. ButI think we’re more prepared now. “Like the manager, like the directors, I’m looking forward to a good season where we can compete at this level for a second time knowing full well that we have been through it once and knowing what we have to do. The Millers have been linked with Sheffield Wednesday’s Chris Kirkland, but Evans has said he had been led to believe the goalkeeper will sign a new deal with the Owls.